[The information below is a condensed version from the transcript of a TED talk given by Dr C. Noel Bairey. You can get the full transcript and see the video of her talk by going to the link below. I urge you to do so. Before you read on I would like to say this, “In my opinion it is appropriate for post-menopausal women to discuss with their doctor, appropriate investigations that will pick up any sign of heart disease. Remember often the first sign is a heart attack, which in many cases is fatal”. One out of two women will be impacted by cardiovascular disease in their lifetime. It is a leading killer of women, a fact that is not well-know. We have traditionally thought of heart disease as a men’s health problem. Sure, we know that women are at increased risk after menopause, but the actually severity and frequency of heart disease and heart attacks in women has not been highlighted enough. It is a simple fact that more women die from heart disease than men. Over several decades we’ve seen a marked decrease in the number of men dying from heart disease. This is not the case for women. More and more women are dying from cardiovascular related problems. What might surprise many is that heart disease kills more women at all ages than breast cancer. What these statistics suggest is that the diagnostic and therapeutic strategies, which have been developed in men, by men, for men for the last 50 years work very well for men but NOT FOR WOMEN! So, why is this the case? It is because women do not look like men, they don’t present with the same male-pattern heart disease for which we have spent the last 50 years developing diagnostics and treatment programs. This means that heart disease in women is often not detected and therefore not treated. THIS IS A SERIOUS ISSUE FOR WOMEN, because unlike other conditions such as breast cancer, heart disease often kills very quickly. There may be no opportunity to say good-by, no opportunity to take her for chemotherapy, no opportunity to help her pick out a wig etc. The first time it strikes it will cause sudden cardiac death in up to 50% of people (men and women). Women are more likely to die of a heart attack than men, and many of these women will never know that even had heart disease! “So I’ll describe the male-pattern heart attack first. Hollywood heart attack. Ughhhhhh. Horrible chest pain. EKG goes pbbrrhh, so the doctors can see this hugely abnormal EKG. There’s a big clot in the middle of the artery. And they go up to the cath lab and boom, boom, boom get rid of the clot. That’s a man heart attack. Some women have those heart attacks, but a whole bunch of women have this kind of heart attack, where it erodes, doesn’t completely fill with clot, symptoms are subtle, EKG findings are different – female pattern. So what do you think happens to these gals? They’re often not recognised, sent home”. And, of course no treatment is given. Although heart disease can affect women of all ages, it is much more common in women after menopause. As we have seen in the information above, heart disease is often missed in women. In my opinion it is appropriate for post-menopausal women to discuss with their doctor, appropriate investigations that will pick up any sign of heart disease. Remember often the first sign is a heart attack, which in many cases is fatal. Have you, or anyone you know, totally had ENOUGH!! of menopause? If the answer it YES, then this workshop is where you need to be. It will help you reclaim your life and by the end of the day you will feel refreshed, empowered and know how to truly be the Mistress of YOUR Menopause. 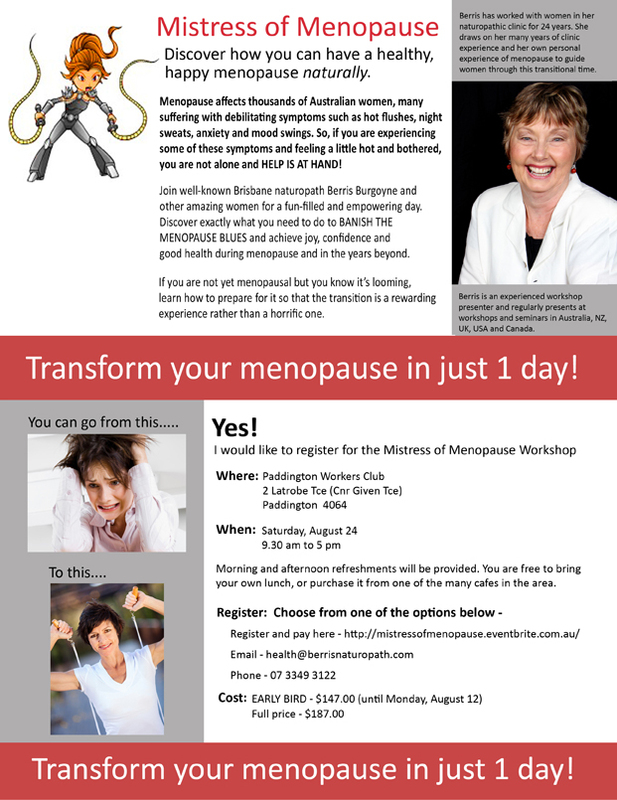 For more details – See the workshop postcard below and go to my website http://www.berrisnaturopath.com to view associated videos.